Microwave Ablation | The clinical cure rate of Microwave Ablation (MWA) to early stage liver cancer is over 90%, significantly effective for middle & advanced stage liver cancer. The clinical cure rate of Microwave Ablation (MWA) to early stage liver cancer is over 90%, significantly effective for middle & advanced stage liver cancer. If a liver cancer patient is not willing to take surgery or inoperable, are there any other treatment options? Microwave Ablation has brought good news to liver cancer patients, especially to those middle or advanced stage patients who can’t tolerate invasive surgery. According to the specialists in Modern Cancer Hospital Guangzhou, the clinical cure rate of Microwave Ablation to early stage liver cancer is over 90%, significantly effective for middle & advanced stage liver cancer which helps to prolong patients’ lives and improve their life quality. 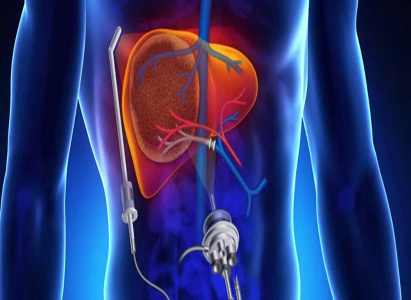 Microwave Ablation has become an important technology for the treatment of liver cancer after surgical resection, liver transplantation. Liver cancer is a kind of malignant tumor that threats human’s life, with a morbidity ranking on the top five of the worldwide malignancies and a high death rate, which makes people become jittery at the mention of liver cancer. The main treatments for liver cancer used to be surgical resection and liver transplantation. However, these traditional remedies may cause huge trauma, increase patients’ pains, accompanied with the disadvantages of slow recovery, more complications, long duration of hospitalization, heavy application of medications, blood transfusion etc.. More disturbingly, human liver has no sensory nerves, consequently, malignant tumors often grow secretly at early stage, and patients can’t perceive. Only when a malignant tumor in the liver grow into certain degree and affects the membrane of liver and other organs, would patients feel obvious pain. While cancer has often grown to middle-late stage at this time and patients have already lost the opportunity for surgery even if they are willing to bear the pain and the risk. Because of this, the treatment of liver cancer used to be a difficult problem in medical science. People were very keen to pursue new therapies beyond surgical resection and liver transplantation. This hot potato was handled until the show up of MWA. According to Peng Xiaochi, a Professor from Modern Cancer Hospital Guangzhou, the effect of using MWA to kill tumor is remarkable and it is favorably compared with surgical resection, thus, MWA is named “microwave knife”. At the same time, it belongs to minimally invasive treatment, which means it would cause minimal damage to the body and it is suitable for most of the middle-late stage patients. It can be said that microwave ablation is the most recent & efficient treatment for liver cancer. How could MWA, a therapy with a pinhole size wound kill liver cancer cells by heat? Regarding to this, Professor Peng Xiaochi from Modern Cancer Hospital Guangzhou said that, MWA follows a physical principle of killing cancer cells by high temperature, namely, MWA kills cancer cells by heat. At MWA, doctors will put a MWA needle whose diameter is only about 2 mm into the liver tumor by percutaneous puncture under the guidance of Ultrasound and CT scanning, and then output microwaves. At the moment, the pinheads of MWA needles are just like a “miniature microwave oven” which releases microwaves constantly. Under the action of microwave field, the polar molecules in the tumor tissues will carry out high speed movement, which would produce heat to warm up the tumor tissues. When the temperature is up to 60℃, cancer cells protein will be degenerated & solidificated, to the extent that cancer cells would be irreversibility necrotic and absorbed by the surrounding normal tissues. MWA can successful prevent a series of disadvantages brought by invasive surgery since the diameter of MWA needle is so small and the wound caused by it is only about 3 mm. Meanwhile, after tumor tissue is killed by heat, it can produce heat to shock proteins, stimulate the body's immune system and improve the immune ability of the body so that it works on inhibiting liver tumor cell proliferation. Therefore, compared with traditional therapies, MWA has the advantages of high safety, quick recovery, good curative effect, etc. and it achieves great therapeutic effect for early, terminal-stage liver cancer.